It's Sunday! Let's make today count! Sundays are often spent dreading the fact that the next day is MONDAY .. so much that we forget to enjoy what time we have left of the weekend! It's a great day to think about the week ahead .. but in a productive way! Spend some time reflecting on your goals for the week, getting prepared so that you don't make poor choices, inking in your training into your schedule (yes in INK) and of course relaxing and enjoying family/friends before the work week begins! Today I'll do a heavier upper body workout and the person I am lifting up and for is another member of the #FitFam. This story is just so heartbreaking to me .. especially as a competitor. 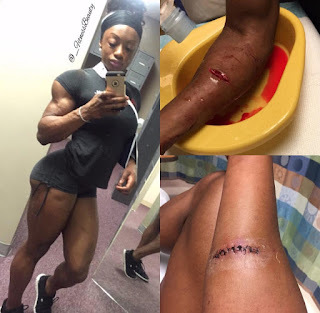 Just one month away from gracing the Mr. Olympia stage...injuries sustained from a scary incident shattered the dreams of IFBB Women's Physique Pro Shanique Grant. One of bodybuilding's most promising young stars (only 21) had to back out of competing in the Olympia. If you aren't a competitor I guess you can't fully understand the heartbreak. To train for this .. to earn that spot (which is NOT easy) ... prep for this caliber of competition and then only weeks away be robbed of the chance to compete. I simply cannot imagine. "So as some of you may know... Monday night, I was set up and was jumped by three girls... In the process of fighting them off one pulled out a knife and stabbed me 2.5-3 inches deep into my forearm, I lost almost 1 liter of blood by time I was officially stitched up (10 stitches). I'm currently suffering from moderate nerve damage, major swelling and torn muscle tissue so physical therapy will be needed very soon. With that being said, I'm sad to say I will not be competing in my ultimate dream at 21 years old...the 2016 Olympia for I will not be able to train nor perform at my best due to my injury. Things happen, I'm not going to say I'm OK. But I am trying to cope with this in the most professional and calming way as possible." The good news is that at only 21 .. Shanique has a LONG career ahead of her. But that doesn't lessen the pain, the disappointment, the hard work that seems so wasted. She would obviously give ANYTHING to be in the gym training today .. so I will not take my ability for granted! I will lift up and for and for Shanique today. I will be praying that she has a speedy recovery and is able to get back in the gym soon. I have no doubt we will see her on that O stage in 2017!